The Tornado was the result of the needs of European air forces for a low-level interdiction/strike machine, one that would be able to survive combat in the Central Front, in sorties against both front troops and rear areas, especially airfields (probably the most heavily defended targets of them all). At the time, technology could only offer “variable-geometry” as the compromise between high low-level speed and a reasonably short takeoff and landing performance (“variable-geometry” was some of a hype in the ‘70s, the term being used for many subjects far off aviation, and it is still today); a reasonably sophisticated electronic suite to allow for all-weather terrain-following and first-pass hitting (comprising a Texas Instruments multi-mode forward-looking, ground-mapping, terrain-following radar, Ferranti digital INS (DINS) and combined radar/map display and a Decca 72 Doppler radar system). 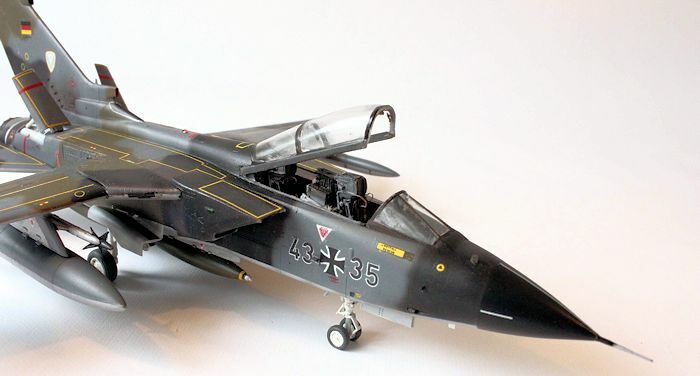 As could be expected from a Western European plane, it is simpler (though not less capable) than the American equivalent (the F-111) and more sophisticated than the Soviet one (the Su-24), and considerably smaller than both. WaKo (Waffenabteilungs Komando, though I have seen it named “Komponente”) is the German Bundesluftwaffe equivalent to a “weapons training unit”. It existed until around 1984 where its role was taken by JaboG 38. I assume it was not just a flying club but that, had the Cold War turned hot, these machines would have gone “to the breach”, just like everyone else. The aircraft, photographed at its base at Erding, during an open day back in 1984, displays the shields of the T. Grp.11 (Technische Gruppe 11) and of the Lw.Vers.Rgt.1, one each side of the tail. 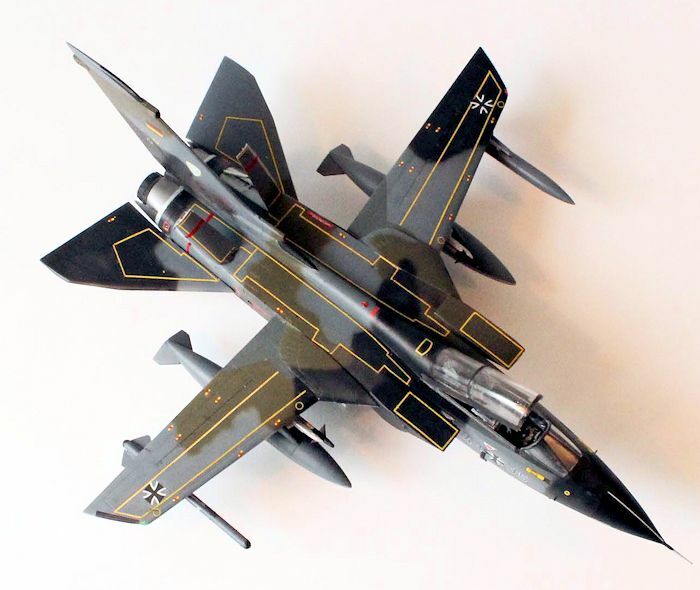 Revell AG Tornado is a small jewel, within the budget limits the firm uses to impose to its kits. It is accurate in shape (the nose cone is the only suspected area) and fairly well detailed. In retrospective, the whole swinging wing and pivoting tailplanes could have been avoided, and these valuable molding be dedicated to a better cockpit interior or a slatted, flapped wing, but I guess the company cared for the youngs ters here. 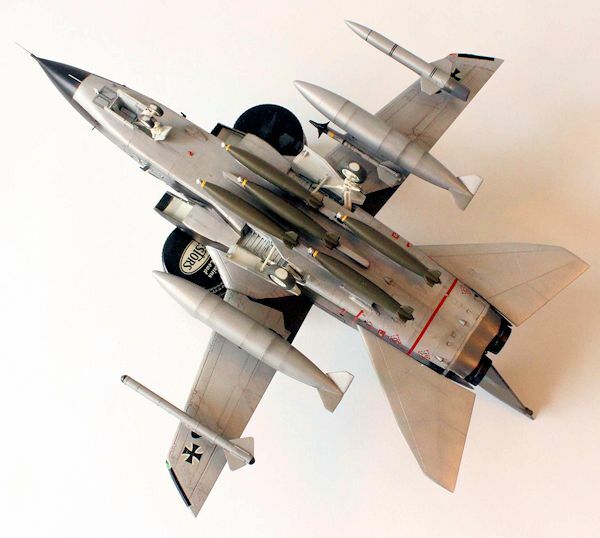 Weapons load, at least in the German boxings, is rather limited (in the RAF GR.1 one, it is outstanding!). Newer editions use to come with cheesy (or spectacular, according to your tastes!) Tiger Meet, anniversary or deactivation schemes; finding operative ones is rather difficult, even as alternatives (I have detected one in Norm 83 camo in the “Boelcke” boxing; one in the “Black Panther” and in an ECR Tiger Meet boxes, in Norm 95). I did a small work to “backdate” the kit, which involved shortening the RWR in the fin and scratchbuilding a new Cerberus ECM pod. Trying to solve the “poor cockpit interior” problem, I added an Aires resin set (big mistake); and to get at least a “partially operative” machine, I resorted to an old Modeldecal sheet, which is a treasure of pre-series and very early operative machines, both Bundesluftwaffe and Marine, in the early Norm 76 scheme. Armament was mainly sourced from a Hasegawa weapons set. As usual, the resin cockpit made it best to founder this project; a lot of swearing and sweat was put into just coercing it inside the fuselage. The front floor was all but obliterated to make room for the wheel bay, and nevertheless I feel the coaming came too high up. The seats look to be too large, and the front one interferes with the stick and instrument panel, whose PE parts kept popping out to the very last. The fact that you have to actually paint all the detail for it to look good doesn’t help. I am really all for Eduard pre-painted PE sets. This being my first Tornado, I assembly the wing, together to the pylons, and the tailplanes as moving units as indicated in the instructions, trusting in gluing them fix at a later stage. Big mistake. The wings proved a chore to get a symmetric anhedral. The moving tailplanes were certainly a help when painting the complex camo scheme (by rotating them out of the way); one, however, broke its peg at the very last moment, forcing me to re-glue it to the already painted and decaled surface. The same happened to one of the pylons. Intakes, the bane of jet aircraft kits, are a black hole. The see through effect can be stopped by some scratchbuilt bulkheads; but the inside of the intakes need some radical filling and sanding, and the fit is not good. There is a piece inside the intake –a sort of divider- I could not asses its right location to this day! I did use an old, copperish Eduard PE set for some external parts. The back of the BOZ 101 was a fine addition, as the internal structures of the airbrakes (great looking, but they proved a chore to fit to the fuselage with them added). Canopy sills (a usually neglected detail) were also provided, as some of the blade antennaes. Undercarriage was also a chore and a potential source of much grief and accumulated error. You have to first glue the well from the inside (glue it well, so that it doesn’t later come out –well, “in”-, inside the fuselage); then, each main leg is separated in three parts, with no positive fit (it is actually better than it looks). With no means of checking alignment as you go, it is very, very difficult that something doesn’t come out crooked in the end. I do not like “weighted” wheels, which are arguably realistic and can be a chore to align, the angle of the seat being rather unknown until all four wheels are in place. Exhausts and rear area, on the contrary, are exceedingly well designed and fit very well. You could even leave the whole rear part aside, greatly simplifying the painting. All in all, the building proved difficult; even accounting for a thumb-fisted modeler used to 1/48 scale Spitfires. The model is not perfectly square, being slightly misaligned; having to my horror detected an asymmetric anhedral (bane of banes!) Attempts to “move” the wings up or down proved unsuccessful and I had to resort to the cheap trick of shortening one of the legs in the main undercarriage to “compensate”. It did, but it threw off alignment all the rest of the model. It is very slight, but visible if you look from the right angle and know what to look for. Having said that the kit comes with a rather lackluster armament selection (or rather no armament at all, loads being a buddy refueling pod and a MBB/Aeritalia recce pod), and considering my desire to depict a “war-ready” operational machine, I had to outsource the weapons. Now, primary armament at that moment was the impressive MW-1 submunition dispenser, now available only in some old Italeri and Hasegawa Tornado boxings. Those were days before smart bombs, so an alternative load was numbers of Mk.83 1000 lb bombs, (I have seen up to eight in pictured, but five being quoted as usual) available in a Hasegawa weapons set; I went for them. The in-box Sidewinders are, no wonder, unusable; I replaced them by those in the Revell Taifun; not that they are perfect (they have no body where the fins are!) but at least the nose and forward canards are great; they can be improved (a slice of rod mimicking the rocket exhausts) and were used. The BOZ 101 was improved with a PE piece for the exhausts; the Cerberus was made from scratch, the kit comes with the more modern Cerberus III, which is markedly different. 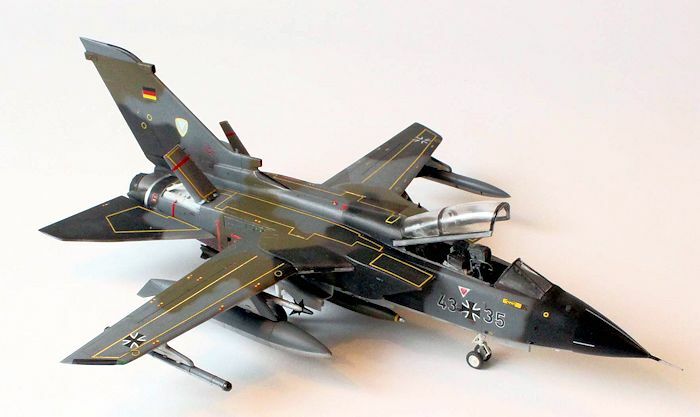 Being an early Tornado, it is painted in Norm 76 (Luftwaffe) of RAL 7012 Basaltgrau, RAL 6014 Gelbolive and RAL 9005 Tiefschwarz, over RAL 7001 Silbergrau. The instructions show the tank with a funny wavy demarcation line that I gave up reproducing. It also says they were painted Geloboliv, but all pictures I have seen show them in Basalgrau. German colours were mimicked with Xtracrylixs paints FS 26118, ANA 613 and Night Black, respectively. Silbergrau was made with a mix of Silver and FS26473 (already tried in an F-4F); it is a paint, not NMF, and was treated accordingly. They were airbrushed free hand, though “floating m asks” (or even hard masks) would have still been true to the scale. They are very forgiving allowing retouches with both airbrush and handbrush; they however tend to clog the airbrush tip every other pass. Gloss coat was from the brand’s gloss varnish, handbrushed; final coat from a mix of the brand’s matt coat plus an artist acrylic flat coat. Again, full marks for the Modeldecal decals. They come in that white-oozy-glue decal paper which does not transmit confidence, but they are thin (to the point of curling on themselves at the first opportunity), leave no silvering and they are opaque and solid. The motives are a bit oversize; possibly they were made for the Italeri or Airfix kits. Instructions are superb, amounting to reference material, with pictures of the airframes depicted in the decals. The myriad of stencils and the awesome looking walkways took time and care to apply. Well, that took almost as long as all the previous steps! But it was almost uneventful, at least. Mk. 83 bombs were attached gluing pegs to the ventral pylons and making a mounting hole on them; then they, as all the rest of the ordnance, were glued with White glue. Undercarriage doors were a bit complicated and the rear front one hangs to an incorrect angle. Canopy is held in place by a big brace I failed to see in any picture; I left it out. Airbrakes were a chore to fix in the correct angle. The look of the model is rewarding; however, it proved unexpectedly tiresome, rather dissuading me from my plans to build a sizeable collection of them (well, might be only a few!). It sits rather straight, when the real thing has a slight but noticeable nose-down attitude (I later learnt that the front leg can be raised to shorten the takeoff run); I have already commented on the slightly crooked alignment. Satisfying, but not entirely encouraging; they are complex kits for its size, and not easy builds at all. - “Panavia Tornado IDS”, Randy Evans, Airdata 2, SAM Publications.